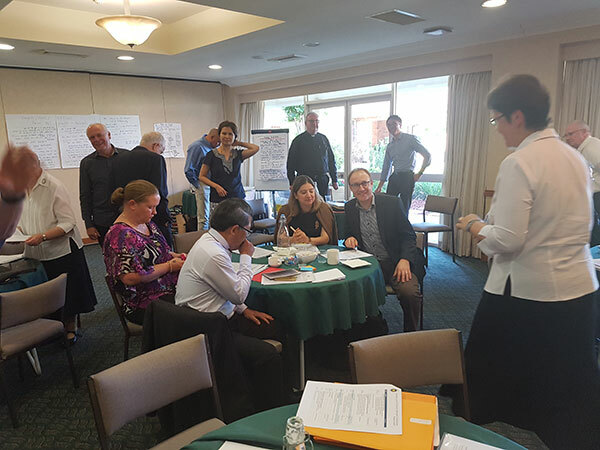 The first joint meeting of the Bishops Commission for the Plenary Council, the Executive Committee and the Facilitation Team was held on October 19-20 at St Joseph’s Retreat Centre in Baulkham Hills, Sydney. It was an important step on the journey toward Plenary Council 2020 which was announced by the Bishops of Australia earlier this year. The purpose of the meeting was to allow the three groups to meet each other and to share personal stories and hopes for the Plenary Council. It was also a time to start building a shared sense of the Council journey with its three phases – preparation, celebration and implementation. Prayer was interwoven through the two-day program with input and sharing sessions in small groups. The meeting looked at the pre-history of the decision to move to a Plenary Council, reaching back to the Apostolic Letter Novo Millennio Ineunte at the end of the year 2000, through to the Year of Grace in 2012, the Royal Commission which began in 2013, the election of Pope Francis in the same year and the Synods on Marriage and the Family in 2014 and 2015. It also looked at what a Plenary Council is (and what it is not) and the history of Plenary Councils in Australia. There was input on the synodality of the Church and the nature of the ‘sensus fidelium’. Looking ahead, the meeting considered the shape of the journey through the next three years and also a framework based upon Evangelii Gaudium which might structure the consultation and from within which a detailed agenda could be generated. Other major themes were the process of formation which will be required for everyone and the ways in which all voices in the Church can be heard and everyone be given the chance to participate in each phase of the Council journey. The meeting came two weeks after the meeting between key people in the Vatican and the President and Vice-President of the Bishops Conference and the Chair of the Truth Justice and Healing Council, during which the Plenary Council was discussed. While in Rome, Archbishop Mark Coleridge also met with Cardinal Marc Ouellet of the Congregation for Bishops to discuss the Plenary Council in more detail. The Sydney meeting built upon those encouraging discussions in Rome. Like many Australian Catholics who are anticipating what the Plenary Council will bring, the Executive Committee contributed with energy, expertise and enthusiasm for the Plenary Council. 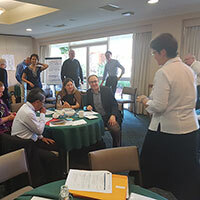 The group is diverse in experience and background and worked together well with the Facilitation Team which had prepared expertly for the meeting and was well equipped to guide an inclusive and multi-dimensional process of consultation, dialogue and discernment for the Church in Australia. The fruits of the meeting will now go to the Bishops Commission for the Plenary Council in late November. Together with the Facilitation Team, the Council will make a presentation to the full Conference in the same week. The Conference will then make decisions about the Plenary Council, which will be referred to the Holy See before Christmas so that the papal consent might come early in the new year. The hope is to have an official national launch of the Plenary Council after the papal consent arrives – perhaps at Pentecost 2018. The Bishops Commission, Executive Committee and Facilitation Team are looking forward to the next steps. Through 2018 and 2019 they will engage with as many people as possible throughout the different groups, sectors, agencies, organisations and ministries of the Church to dialogue and discern the way forward in order to know how the Holy Spirit is leading us into the future. All comments and feedback are invited; please email plenary.council@catholic.org.au to discover how you can be a part of the Australian Plenary Council journey. Download photo from this page. This entry was posted in Press Releases on October 23, 2017 by ACBC Communications.